Barbie House Designs. Much can be said about this beloved doll. She is loved the world over because she is so versatile. Your favorite fashion doll has been there, done that, worldwide, so to speak. Barbie Designs catch Creative Attention as They Emerge. We have all grown up seeing this little doll in movie star, professional, and down-to-earth costumes. Children love her, and with the success of her magazine, Barbie Bazaar, we saw that many adult kids like us did too. It really is too bad that her magazine, eventually closed it's doors. We really did enjoy reading this collectors magazine from time to time. 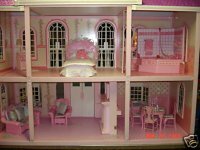 Simply for the amazing dollhouse designs plus collector ideas it presented. 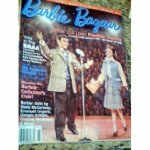 June 1999 Barbie Lover Frankie Sinatra. View this collectible Barbie Bazaar edition here. Before we begin exploring these houses .. It is because of the fame of this Famous Fashion Doll that she is one of our first stops in our miniature dollshouse designs tour. But before we start all that ..
For your information, one of our own personal passions when we were eight, was the creation of some very crude doll clothes for fashion dolls. Just thinking about it makes us laugh. Picture it, two to three holes cut into cloth and crudely wrapped around our poor doll. If she only knew she would have willingly disowned us. She was our personal "cave-woman" version, fashion doll. Doing a Search Online has Revealed Different Issues Regarding This Design of Miniature Mansion. First of all, Amazon.com is definitely one of the best places on the net to explore as far as the purchase of a dollshouse goes for fashion dolls. There or EBay as well. Barbie House. All purposely selected with you in mind. These two sites, Amazon and EBay have a huge number of sellers associated with them and therefore have an enormous variety of prices for merchandise. With them you are definitely bound to get a great deal for any purchase regarding your next miniature designs project. Always Study and Analyze to get the Best Deal for you as you Explore. We have chosen Amazon to research a Barbie House because of the fact that each item you are considering includes the use of other people's various opinions of the item. Any doll's home with a number of reviews to read is always a great point of interest for us. Generally, if someone has absolutely loved or hated their purchase you may read their comments online. Thus helping you to come to a definite conclusion with a "yes I will buy" or "no I will not". If you are a serious collector/dollhouse lover you may or may not enjoy your mini mansion in plastic. We know, personally, we would not, but that is just our opinion on the matter. The better idea for us would be to invest a small amount of time in building a worthwhile dollshouse ourselves. Yes it would take more time but think of the added benefits of doing a project like that. Imagine getting into all the details in miniature. Your personal taste in Kitchen, Dining Room, Bedroom, Bathroom, and Living Room layout. What a true labour of love that would be. And isn't that what being in this hobby is all about anyway. The love of the craft. Try this Alternate Idea as well ..
On Second Thought, though, What about using the Design in Plastic as a Start Point to Recreate your own Barbie House? For instance, purchase the most sound one and totally renovate it? For some that might be an excellent idea especially if you feel unskilled in working with wood. Or perhaps if it is a tad bit intimidating to think of constructing such an immense project on your own. But as well you may say that some of those Plastic Houses are Expensive so gutting it to renovate may be more Money Spent in the Wrong Direction. Though thinking in terms of the pros and cons, what about the expense of starting from scratch with wood? Most likely a project in wood will require as much expense if not even more. Guess it's as they say, it depends on what you are looking for and your overall budget. We are just here to throw some ideas around and help you choose what your next doll's home project will be. Yes someone took the time to create an amazing Barbie Home. Take a tour through it right now and enjoy all their creative elements that they included. You will not be disappointed. We definitely were not. It is a house to wish you owned personally! View the above amazing Barbie House that was raffled off. Wouldn't you love to own it? Or better yet, build it? 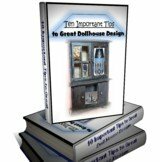 Next continue your journey to a new Dollshouse Design by visiting our article: The Enchanting Victorian Dollshouse.